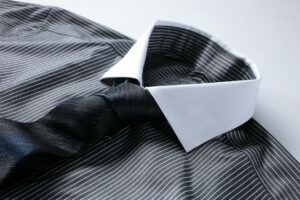 If you work in the business world under the obligation or expectation that every day you will come to work wearing a nice shirt and tie then this article is for you. I have had past students tell me that they can't carry a concealed weapon every day because they have to wear a tuck-in shirt. This should not be a barrier to carrying your gun. There are IWB holsters that will work with a tucked in shirt. My favorite is the Brave Response Holster. It operates with a belly band that allows the holster to move and sit independent of the pant or waist. Just situate the holster in the pant along the waist or higher on your torso if you prefer an armpit style carry, and then tuck in your dress shirt. The tighter your tuck, the more discernible your firearm could become. So, go with a loose tuck. You can also get tuckable IWB holsters that do clip onto the belt but still allow you to tuck in your shirt. My favorite tuckable holster is made and sold by N82 Tactical. But, there are plenty of others out there, as well, that may work for you. Ankle holsters have been around for a long time and have proven effective for concealed carry. Some are better than others, and some are far more comfortable than others. ALL ankle holsters require a light and low profile weapon. When you are wearing a nice pair of dress slacks you should find that there is plenty of room to conceal a weapon on your ankle without leaving any profile for observation. You do however have to actively avoid sitting in a position that would give away the weapon. Matthew recently wrote an article on how to draw a gun from an ankle holster. If this is your preferred method of carry, we strongly recommend you read it and practice your draw, regularly. My favorite ankle holsters are make by Alessi Holsters. If you have ever watched any cop movie, you have probably seen shoulder holsters in action. Obviously, a shoulder holster is only going to work for if you go the extra mile and decide to wear a suit or sports jacket. That said, a shoulder holster can be a very comfortable and practical method of concealing your firearm when dressing for your meeting. The best shoulder holsters are anchored to the belt on both sides and have some sort of balancing weight on the opposite side of the gun. My favorite shoulder holster is made by Galco Leather. There are a good number of apparel options on the market for concealed carry. It could be expensive to stock up on a good number of dress shirts that have built in holsters, although I wouldn't discourage it. As an alternative you might look at tactical undershirts that you could wear under your current dress shirts that would fit the need. Tactical shirts generally have built in holsters or pockets that work well to secure and conceal the weapon. They are most effective when they fit tightly against the body. My favorite is the 5.11 Tactical Holster V-Neck shirt. The concealed carry in a suit and tie rig you decide on is ultimately up to you. All that we ask, is that you train getting your gun out of your holster, often, so you're proficient with it should that time come when you need to defend yourself. I have the urban Carry holster, my firearm is so concealed that no one knows that I’m even carrying a gun. I have 2 tactical undershirts that I used with my previous job but I found that my gun was too loose and would fall out if I bent over. Solution, used a pocket holster with the tactical undershirt. This also helps keep sweat off my weapon. Also for ease of entry i sewed 2 velcro dots on each of my button down shirts were the 3rd and 4th buttons used to be. I simply slide my had through my shirt and the velcro pops. I’m a pastor who conceals with my suit. I use a pocket holster which works well. I keep an extra mag clipped onto my belt. No one has asked me what it is even when I take my suit coat off. I’m a pastor who is never, ever unarmed, especially when I’m preaching. For me, it’s pocket carry. No one would ever suspect. Suit and tie? One of the easiest concealed carry situations there is. Like to keep your jacket buttoned? Shoulder holster. Like your jacket open . . . .A subcompact in your inside jacket pocket. Leave your jacket on and open all the time . . . small of the back. I’ve done a lot of CP work in all sorts of clothes, but a suit is one of the easiest to conceal in there is. I wore the 511 Tactical V-Neck shirt for over 8 years while wearing a long sleeve shirt, Tie and Jacket. It takes some time to get used to it. I carried a issued Sig 229 that I was required to carry while on duty. The one thing people have to train on is the person utilizing this 511 shirt is the cross draw. Not to many concealed carriers or law enforcement officers are trained on cross drawing a firearm. I also had a Velcro carrier around my ankle to carry a set of handcuffs and a small tactical knife. The best part about this ‘deep concealment holster’ (do not laugh) is when I had to use the restroom I never had to worry that I would leave my duty issued firearm in the bathroom. Believe it or not but law enforcement officers have a bad habit of leaving handguns in bathroom stalls to include lavatories on commercial aircraft. The 511 Tactical V-Neck shirt will never let you down. I spent years looking for and trying out the “perfect holster”. What I found was there is no such thing. There is the best holster for a particular situation, mode of dress, place. You need various holster options. Like any other tool, there is the right tool for the right job. The most important take away of this article is to train presenting your weapon from every holster option you will use. I also have to wear dress casual with a tucked shirt every day. I am slim, so super baggy clothes won’t work for me. However, the Brave Response holster works with a Glock 43, .380 or a 38 snubbie. I have a wallet holster for my .380 that hides well for some of my slimmer slacks. It can definitely be done, just not with a full size gun, not for me anyway. Leave a Reply to Mikial Click here to cancel reply.